How To Use Vacuum Cleaner For Carpet Cleaning? Will Hardwood Flooring Increase My Property Value? What are the Best Pros and Cons of Ceramic Tile Flooring? Carpet vs Hard floors: Which is easier to maintain? Industrial Flooring: Which type is right for my business? Have you ever felt like your kitchen doesn’t quite reflect you and your style? That it could do with a bit of an upgrade? Perhaps you feel like your kitchen doesn’t excite you anymore (if it ever did!) or it needs a bit of a spruce up? You might have even recently bought a new home which leaves you with a blank kitchen canvas and no clue on how to decorate it. Or possibly your friends, neighbors, or colleagues have incredible kitchens that you aspire to have; one that stands out from the crowd and really speaks on your behalf. Well, that dream doesn’t have to be so hard to achieve! These types of tiles are ones that are literally not being produced anymore by manufacturers and companies. Some companies can source discontinued tiles from areas around the UK and abroad and then they sell them to us! The reason why these tiles are special is the pure reason that they have stopped being made therefore it is extremely rare to see someone else with the exact same discontinued tile. Whilst discontinued tile stocks are usually used for replacing old broken tiles, using them for specific design purposes is a totally new trend – of which you are at the forefront! Using discontinued tiles in your kitchen design will not only give you that unique look that nobody else can possibly have, but also the chance to design an indoor interior that can be all you. How do you use discontinued tiles to style your kitchen? Unsure of where to start? Never fear! Below are a bunch of our best examples of different techniques that you can use to create an awesome kitchen vibe unique to your home! We go into more detail in how you can craft a cool look with tile artwork on your wall… and even your ceiling! 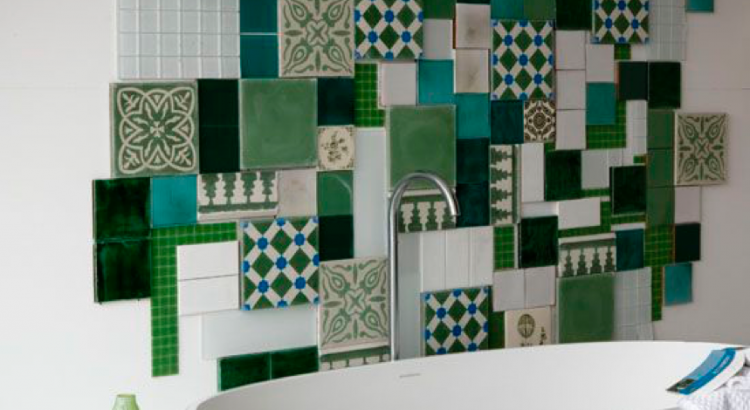 Tiles aren’t just designed to go on the floor – get creative and create the style that YOU want! Remember it’s all about portraying the real you in your decoration, with your choice of color, pattern and theme. It can be any size from a small arty design to an enormous tile artwork, covering an entire wall for a mural type look. Tiles with animals can be really cool for smaller pieces of wall-work, surrounded by complementing patterns in a tile frame. For bigger murals, consider designing a shape with your tiles and mapping out in pencil where they will go – different colors can be used to create images themselves, or a slow change in color across the wall can look amazing. In kitchens, above the cooker, there is usually a clear blank space – ready for your arty enhancements! Planning to have your discontinued tiles above the cooker is a great place as it is the focal and central area of the kitchen. Your friends will be envious! Cooker wall decoration is usually quite similar to small wall tile artwork, and can work great with a central focal tile surrounded by patterned tiles. Tiles are also ideal to use for the entire wall surrounding the cooker, since tiles are easy to wipe clean and this back wall often gets spotted with oil and other food. Practical and pretty! You may have some old, dirty and cracked tiles randomly in your floor that desperately need replacing. Taking up some tiles in a cool pattern across your floor and integrating unique discontinued tiles deliberately into your floor design can be a cool way to refurbish a floor that needs a bit of love – and replace tired tiles in a seamless transition. Alternatively, if you are designing a totally new floor, incorporate discontinued tiles into your design with other tiles for the ultimate look you can be sure no one else has! If you manage to obtain a rather large stock of discontinued tiles than you can always replace your entire kitchen floor. This way you can get that extremely unique look with a floor of patterns, colours and shapes that absolutely no one else can get their hands on! If having these exceptional tiles on your floor and wall isn’t creative enough (and you’re feeling brave), perchance take a shot at creating a design to go above your head! A charming idea in addition to having these tiles on the ceiling is to border the discontinued tiles around your light fittings. You could get polished tiles that amplify the shine of the lightbulb to give off a stunning and cosy feeling to your kitchen. Now that you have some knowledge about discontinued tiles and how you can decorate with them, we hope you enjoy decorating your kitchen – or even other areas of your home! We would love to see your tile designs and how you got on so do take lots of photos and send them over to our twitter! Hardwood Flooring vs. Laminate Flooring – Which Flooring Works Well with Pets?